If you're on a diet it's super easy to get great food here just get a salad a...For taco salad, 3 tacos, and a burrito,...Had my favorite , their cheese dip and chicken tacos. I was just ok for us. I’ve been to several Moe’s around and this one wasn’t as good. Fun town though with many things to do. 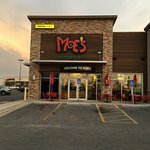 I always like to eat at Moe's when I come to Branson. They are always give you tons of fresh food no matter what you order. Awesome food... awesome ppl..we sat and ate and had laughter..they even told us some hot locations..
We had to get our Mexican food fix while we were in Branson this last time. We all got the Burrito Bowl and everybody took enough for a good snack ffor the next day. 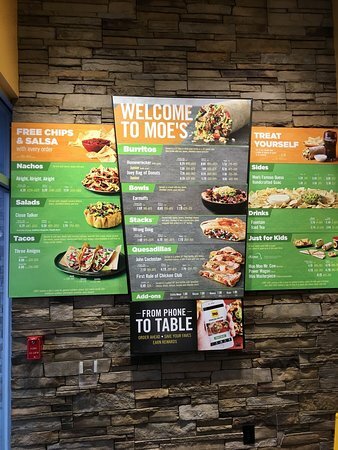 We love Moe's because we can get exactly what we want. Very delicious and very friendly. Go there ! So much better than Qdoba!!!! My wife had the quesadilla and got to build it with the things she wanted. And I had the wrong dough which was amazing !!! Great taste!!! My family really enjoys eating here. We've ate here the last 2 times we've been in Branson and loved it both times. I'm sure well eat here again in the future. Consistently great southwestern/mexican food. We like everything there, but the nachos are always my favorite. Get quick answers from Moe's Southwest Grill Branson staff and past visitors.